Please be aware that membership for 2019 is now closed. If you join between now and March 15, 2020, you will be part of the 2020 Membership Class. You will be welcome to attend all our membership events during 2019 but will not be able to vote for the 2019 grantees, or sit on a grant review committee in 2019. In 2020 you will be accorded these rights. By becoming a member of Impact 100 Jersey Coast, you are joining a community of women united in a common cause: to provide high-impact grants to exceptional nonprofit organizations serving Monmouth County, NJ. At this time we are unable to accept membership donations in installments. Your full membership donation of $1,100 must be received before March 15th to be included in that year’s grant award process. To secure your voting rights at the Annual Membership Meeting, your nonrefundable membership contribution must be received by March 15th of that year. Of course, we are happy to accept new members any time of the year! Those joining after March 15th will be welcomed into the following year’s membership class and their donation will be restricted to that year’s grant fund. They will be immediately welcome to participate in all ongoing membership activities and attend all membership events, including our Annual Meeting. The one exception is that these members will not be eligible to sit on a grant review committee or vote for the grant recipient in the current year, but will be accorded these rights in the next year’s grant process. Please complete the pledge form via the button above to be directed to payment details. Payment can be made by check, credit card or funds transfer. Please note that a 3% Processing Fee will be applied to your donation to cover credit card processing fees. To donate by Electronic Fund Transfer (e.g. Donor Advised Fund, IRA, stock transfer) please contact membership@impact100jerseycoast.org to confirm the name of this fund so that we may accurately match this donation to your pledge. When designating your gift with your fund holder, please specify that this is a charitable “contribution” in the memo line to avoid any confusion. Please do not send checks directly to CFNJ. Questions About Your Membership Donation? 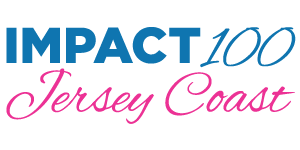 Please check out our FAQs or contact our membership team anytime at membership@impact100jerseycoast.org. Increase your giving with Corporate Matches! Many companies will match donations made by their employees and their employees’ spouses. For more information on this please contact Lisa Atallah at 732-991-0854 or matching@impact100jerserycoast.org. With more than 65% of Fortune 500 companies and smaller employers offering matching gift programs, the impact can be substantial. In 2011, one Fortune 500 company gave $48.9 million in matching gifts to nonprofit organizations supported by its employees. It is estimated that 6 to 10 billion dollars in matching gift funds go unclaimed each year. Become a Friend of Impact! If you’d prefer to make a donation without becoming a member, find out how you can become a Friend of Impact 100 Jersey Coast. Please contact membership@impact100jerseycoast.org with questions.